Epic Battle Fantasy 5 is out! The Steam version of EBF5 is out! Compared to the free version (coming soon-ish), it adds 48 extra equips, 5 new dungeons, and 10 new bosses, including many of the hardest ones in the game. Other perks include HD graphics and audio, a choice of screen resolutions, and Steam features, like cards, achievements, and cloud saving! 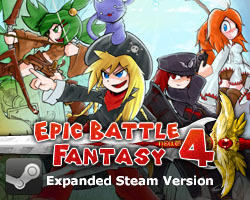 Everyone who owns EBF4 on Steam will get a 20% discount coupon for EBF5. This needs to be launched by a human from Valve, so there might be some delay getting these out. The coupons will be valid for a month, and after that I’ll release a Steam bundle of EBF4, EBF5, and Bullet Heaven 2. This bundle gives you 20% off if you “complete the set”. If you only own EBF4, for example, you can buy the other 2 games together for 20% off. This will be a permanent deal going forward, and it works in conjunction with other discounts. I’ve prepared an EBF5 asset pack for YouTubers or reviewers, which includes different variations of the cover art, screenshots, game info, and in-game emoticons. If you want to support Phyrnna directly, buying the EBF5 soundtrack on Bandcamp will give her a much bigger cut than she gets from Steam. It’s also available on most music platforms. The EBF Discord is a good place to talk with other players, and to get help if you get stuck in the game. You can also report bugs and other problems there. The free web version will be released once I’ve had a break from the Steam release. The beta will stay up on this website, but it’s already quite outdated and buggy compared to the Steam version. Saves between all versions will be compatible, and easily transferable with the save backup feature. Saves from the beta may have a few minor problems – such as permanently missing an equip or two if you save in the wrong place – so it’s better to start again. This entry was posted in Epic Battle Fantasy 5 on November 30, 2018 by Matt Roszak. Can’t wait to play! Thank you Matt!! Yush, just got the mail from steam, waiting for coupon-man to do his job. Not even waiting for the coupon, huh? I can dig that. Um… either you have it by now or you don’t own EBF 4. In either case don’t sweat it. Woo! Can’t wait to play it when I get home from work! I remember when 3 came out during the first week of my freshman year of college and I’ve been hooked since! I’m sure that it will be amazing, as all of the others have been! The music was too amazing. However after playing the 3rd part later i was completely convinced both her and Matt together gonna go far. Thus Fan to the whole series and following the progress for nearly ten years now. Anyway thank you very much Matt for all the work, you’ve done it now! Get some good rest! Ah so that’s why you have that name. Is it possible to give the coupon to a friend or does it requires to have EBF4 in your steam library to work? I’m not sure if the coupons are tradable. But you can always get a refund and buy it again with the coupon later. Did I see a Devil Cat summon in the asset pack? You should see one in your Steam inventory, whenever Valve gets round to sending them. It automatically activates when buying as soon as you have it, you can however deactivate that manually during purchase. Hi Matt! I’ve just recently bought the steam version, but I’ve run into a major bug! After playing about 40 minutes, the game is asking me if I want to allow flash to store local information on the computer, allow or deny. However, the problem is that you can’t click either allow or deny, and its not letting me get back into the game, and whenever I try to reboot it, the flash notice pops up and I can’t select it! Aw man, that’s not good. You should probably refund the game while I try to figure out why that happens to some people. Alternatively, you can go into the installation folder of EBF5, and just run the Flash version “Epic Battle Fantasy 5.swf” using “Flashplayer Windows.exe”. That might work okay for now, until I get this problem fixed. I actually managed to fix the problem myself. Strangely enough, the fix happened when I went full screen, but with small and medium screen I had the problem. Thanks for the concern however, and you still might want to look into that anyhow. That’s really good to hear. I have no idea why it freezes up like that, but the good news is you’ll probably never see that pop up again. I was wondering how I could get the 20% discount in EBF5 since I got EBF4 on Steam? Valve is taking their time with those coupons… hopefully they will send them out soon. How will we receive the coupons just to know? Automatically, you should already have it. Steam tells you instantly when you receive it. So I’m a dumb dumb. I own a mac. Saw how you said you can run the game on mac via installation folder, so I was like “oh cool” and bought the game. Now that I own the game, steam does not let me access, or even find said folder. Sorry for the trouble! I’ll write a walkthrough for setting it up once I know the best way to do it. I agree here with SadMan. I love the game, and I’m dying to play the full game. I’ve bought it on Steam and now the wait until I can play it my Mac! There’s no plans for an “official” Mac version. If you can’t download the files from Steam, shoot me an email and I’ll send them to you manually. Great! After my exams next week, I will probably buy a Steam card to securely put $20 on my account, and then use the coupon when it is added to my account! Looking forward to playing the extended version college winter break. May start working on taking to my friend about making Prodragonists of Drakerin as well. Very excited, and thanks for the coupon! Just got game. Will leave a positive review to help the algorithm out in a bit. So, are the coupons already delivered? if so why im not getting one? Coupons are live now, you may need to restart Steam to get yours. 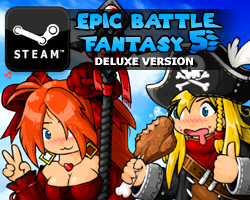 Don’t forget to add the cover of ebf5 to your website at the rightside so you can directly click on the game. Hey, Matt: Quick bug report, nothing too bad. An enemy buffing itself to 100% of any stat will grant the player the achievement for buffing themselves to 100% of a stat, as seen on the Hardy Gloops’ enchant move. Game’s awesome so far, by the way! Also, game seems to chug a bit during multi-hit moves, same as every other game in the series. Matt, will you make a walkthrough this time like you did for 3 and 4? There are so many hidden treasure chests, I am afraid I may not be able to spot them all. I am on epic difficulty now, bosses are hard as hell, tips are well needed. I’m sure the wiki guys will eventually make a very detailed walkthrough. We made a walkthrough and nearing completion, not sure if we can post it here though. Sorry if it was asked before, but are you going to upload premium version to Kong’s Kartridge? I’m not sure. I might do it, but probably only after GoG and Humble Store. I’ll be sure to get it when I have the time. I’m writing here to thank you, Matt, for this game and for the the effort. I’ve been playing the series before EBF 4 was released and when I think about all the details and all things there are in the game, and that it’s done almost single-handedly, it makes me feel… really admiring. Thank you again, I’ll write steam review when i’m finished with normal difficulty and update it when i’ll Finish epic. I’ve also got that Flash data permission issue. It won’t let me click anything at all, including the mini window asking for permission to modify data. Fullscreen doesn’t help. It happens at the title screen 100% of the time, I can’t play at all. I’m 15 hours in and don’t want to lose my save! How can we fix this? Some workarounds people have found: You may have “Flash player” settings in your Windows control panel, where you can allow local files, and that could stop the pop up from appearing. Some people have also mentioned that the pop up is not frozen if they try a different screen mode (fullscreen, etc). A final workaround is just to just use less save slots, or use the backup save feature. Let me know how it goes. The good news is that once the pop up is cleared, it shouldn’t appear again. It’s not working. Right-clicking and hitting Settings gives me a slightly different window that I still can’t click. Global Settings brings up a thing that shows it’s set to Allow Storage (but doesn’t do anything, and I’ve tried all variations of it). There’s no Flash settings in my Control Panel. It won’t let me make the window fullscreen once the popup appears, and it appears regardless of whether I make it fullscreen or not during language selection. I managed to find the .sol files in my appdata folder. Backed up all my saves into a new folder, deleted some of the older ones. Seems to be working now. Someone mentioned if you get the pop up, to make sure “Epic Battle Fantasy 5.exe” is set to always “run as admin”. That could possibly help. Woo! Got my copy, can’t wait! I ran into a bug with the cloud saving via Steam. I beat and captured the first boss on Epic difficulty on my desktop. When I played on my laptop, I got the save from the cloud via the button fine, but the medals did not transfer. I have the acheivements on Steam (same username), and still have the summon, so I assume it just misses checking those medals on download? Ah, good point! That’s probably an oversight on my part. If you want to transfer the medals, you’ll probably have to use the backup save feature to do that. I’ll try to fix it soon. It’s just the first boss, so it’s not too tedious to just do it again. Thanks! I found a bug with the resolutions. The 1080poption didn’t fit my screen, but the 720 did. Also, enabling fullscreen changed my computer’s resolution to 720, causing all my icons and such to be large. Restarting the computer didn’t help, I have to go into my computer settings and change it back to 1080p every time I enable fullscreen for EBF5. OS is Windows 10 BTW. Great game, loving every moment! The resolution should be set back to normal when you exit EBF5. Seems that doesn’t work for some people, so I’ll have to work on it. 2. Even though I haven’t got 4 or 5 yet I thank you Matt for all the time, love, and dedication you’ve put into all your games. 3. Merry Christmas and happy holidays to you all! Wait… why is the book of the religion of godcat called: “the book of cactus?” i mean if that’s shown in the game then don’t feel the need to spoil it, but like… wtf? Greetings, Matt, forgive me for leaving it here, but could you please tell me if it is possible to speed up animations in combat? Doing challenges is quite a lengthy endeavour and seeing how much I am repeating it, it takes quite a while to go through each battle. I understand there is no button to speed up/cancel animations yet, but could you please consider it? Or maybe you could tell me how to speed it up using the configurations of the game (if such is possible)? Is the game running slower than normal? Have you tried turning down the resolution and anti-aliasing? No, it is not about performance – I am talking about speeding animations up to enjoy the fight, but not the animations (or potentially cancel them completely). Like some games that have game speed up buttons 2x 3x 4x, something like that. Could you please implement them in the game, or tell me of a way to tweak some configuration files to make the animations go faster? Ah, I’ll consider it if a lot of people ask for it. At a time where Darksiders 3 is infuriatingly troubled and I’m in the middle of whatever winter bug is going around (please patch, this bug is awful), this game is just the kind of relaxing nostalgic fun I needed. Thanks for the monumental amount of effort you put into this, wishing you all the more success for you in the future. It’s not letting me continue to reply in that chain, but it’s happening again. Deleting saves isn’t helping this time, and neither is running it as an administrator. Oh, finally! I copied over my saves to the folder it creates when I run the swf folder byitself, and now I got the popup in the browser instead of the exe. It actually let me click Allow, and now the exe is working. Geez! If you’ve purchased the game and don’t know how to run it on your Mac, you can shoot Matt an email at kupo707 at hotmail dot com and he can send you the game files so you can play the game. Unfortunately, none of the Steam features will work (Steam achievements, cloud saving), but it’s still the same game. can we see ebf 5 in another site[like kongregate]soon? I’m on mac and just purchased on Steam and was hoping for a download folder but I can only seem to install through the steam app. I know you disclaimed there’s no support, but any instructions on how to just get the swf?